Prime Minister Ranil Wickremesinghe speaks at the Puttalam District UNP Bala Mandala meeting in Chilaw on Saturday. 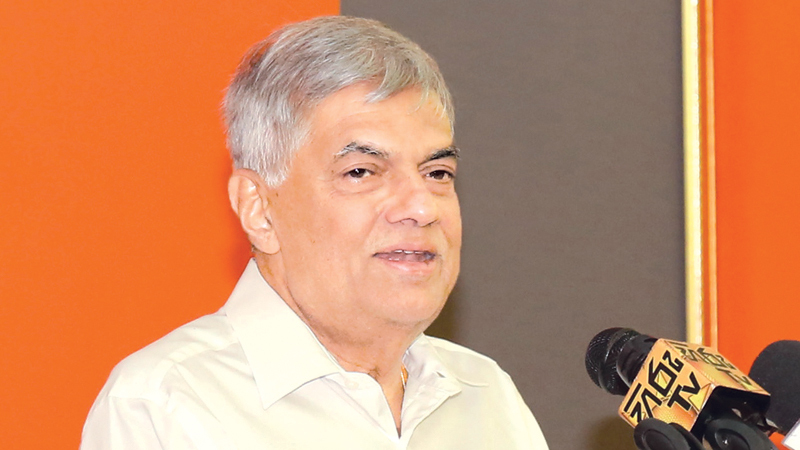 We took over the country when it was going through a really difficult time and former President Mahinda Rajapaksa called for an early Presidential election since he could not take the country forward, Prime Minister Ranil Wickremesinghe said. The Premier was speaking at a Puttalam District UNP Bala Mandala meeting on Saturday at Arora Hotel in Chilaw. “The present government also introduced the 1990 Suwaseriya emergency ambulance service. When we introduced this, Opposition members criticised it. But the ambulance service was used to send September 5 protesters to the hospital,” the Prime Minister said. Facilities were given to 9,000 schools under Langama Pasala Hondama Pasala concept of the government. The Suraksha insurance scheme was introduced for students. Measures have been taken to fill 4,000 principal vacancies. The Mahapola scholarship was increased to Rs. 5,000. Around 110 Uda Gammana villages have been established. The middle-class housing programme was implemented, the Premier said.